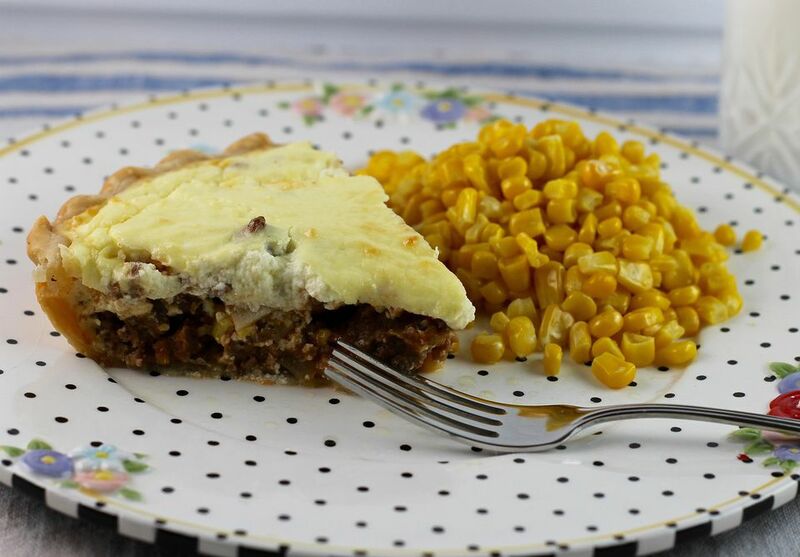 This recipe for Beef Cottage Cheese Pie is one of my favorite comfort foods. My mom made it when I was little, and I don't even remember where she found it. It may sound strange to you, with the cottage cheese topping, but try this recipe - it's really delicious. I love any type of meat pie, but especially those made with ground beef. The savory beef filling is flavored with onion, garlic, ketchup, and mustard. It is put into a flaky pie crust, then topped with a mixture of eggs and cottage cheese. The egg mixture puffs up slightly when the pie bakes, forming a quiche-like topping on the rich beef mixture. The pie slices beautifully after it sits for a few minutes out of the oven. Kids especially love this recipe. I have fiddled with the recipe over the years, adding more mustard (natch) and marjoram, which I think is the perfect herb to complement beef. You could add more herbs if you'd like, but try it this way once first. Serve this hearty pie with a green salad tossed with avocado and sliced mushrooms, and a fresh fruit salad. Some brownies for dessert would be the perfect finishing touch. Preheat oven to 350°F. Line the pie pan with the pie crust and flute edges. Set aside. Cook the onion, garlic, and ground beef in a heavy skillet over medium heat until the ground beef is thoroughly cooked, stirring to break up meat. Drain off any excess fat from meat mixture. Add the ketchup, mustard, flour, dried marjoram leaves, salt, and pepper to the skillet with the meat mixture and cook and stir for 3 minutes. Remove the skillet from the heat and let cool for 10 minutes. Turn this meat mixture into the pie crust lined pan and smooth the top. Don't press down on the mixture; just make sure the top is smooth and even. In a small bowl, beat eggs and add cottage cheese and Parmesan cheese; mix thoroughly. Pour this mixture over meat in the pie pan. Bake the pie at 350°F for 30-40 minutes, or until filling is set, crust is golden, and topping is set and starting to brown in spots. Let the pie cool for 5 minutes, then cut into wedges to serve.